Scott Mortimer of Merrimack, N.H. is a 37-year-old marketing manager who has spent the last few years trying to get every card in the 1983 Fleer set autographed. This is, arguably, the ugliest set of baseball cards ever made. It may also be the only baseball card series designed with a taupe border. 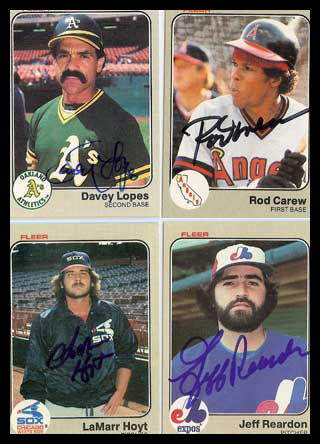 The cards do have the advantage of documenting the greatest era of facial hair in modern baseball history. In 1986, when I was 9-years-old, my father brought me home two boxes of unopened 1983 Fleer wax packs. These ugly cards formed the heart of my growing baseball collection, a hobby that would turn into an obsession by 1988. Eventually I would start selling my cards at shows at making hundreds of dollars a day (not bad for an 11-year-old). The baseball players on those cards were my heroes. I memorized their stats, the towns and years of their births. I remember thinking that players born in 1961 (say, Don Mattingly) weren't that old. According to his recent interview with yahoo, Mortimer has 435 signatures, good for a 64 percent set completion percentage. A tough 36 percent remains." Some of those players have disappeared. Some are working as used car salesmen or forest rangers. One is apparently some kind of deaf mute living out his days in a Central American convalescent home. Heroes, once. All of them. Many are now dead. It is unclear if he will even be able to finish his project. And I can't help in using that strange fact as some reflection on my own age. Kids today necessarily view these 1983 cards as I once viewed the 1961 Topps set, that mythical Maris card of the blue-eyed slugger or the 1964 Mantle I bought autographed at the Southland Mall baseball card show in 1989. Oh Rod Carew, say it ain't true.